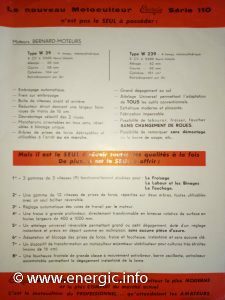 2 models – model 114 motor Bernard W39 initially then came the model 115 motor Bernard W239 from 3/1963. 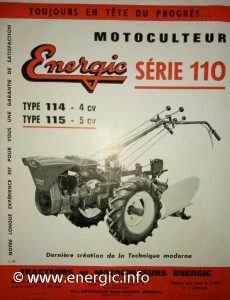 The 110 machine is very versatile and can, with adaptions, be used for 3 types of work; For rotivation (Le Fraisage), plowing and hoeing (Le labour et les binages) and cutting grass/hay (Le Fauchage). This motoculteur has a large ground clearance. 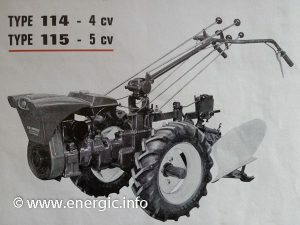 It is possible to change from the rotivator to hoeing, to mowing/grass cutting without changing/or removal of the wheel. 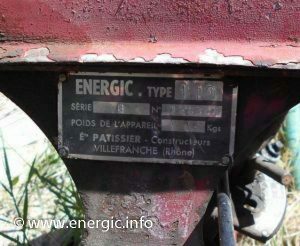 It can also be used to pull a trailer, with the removal of the ancillary equipment. For safety while using the cutting adaption, it is possible to disengage the blade very quickly.